Funeral services will be held at 4:30 o’clock this afternoon in Emmanuel Protestant Episcopal Church for Mrs. Marie Conrad Lehr, wife of Dr. Louis Charles Lehr, who died early yesterday of pneumonia at the home of the Misses Sally and Polly Carter, Washington Apartments. With a simple service, conducted by the Rev. Dr. Hugh Brickhead, the body was taken yesterday from the apartment and placed in the Memorial Chapel in Emmanuel Church that Mrs. Lehr built recently in memory of her mother, Mrs. Lawrence Lewis Conrad. Following the services in the church today the body will be taken to Montmorenci and interred in the old-family burying ground tomorrow. Mrs. Lehr was the daughter of the late Mr. and Mrs. Lawrence Lewis Conrad. Her mother was Miss Sally Howard Worthington, of Montmorenci, in Worthington Valley. On the paternal side Mrs. Lehr was a direct descendent of Nellie Curtis, daughter of Martha Washington. 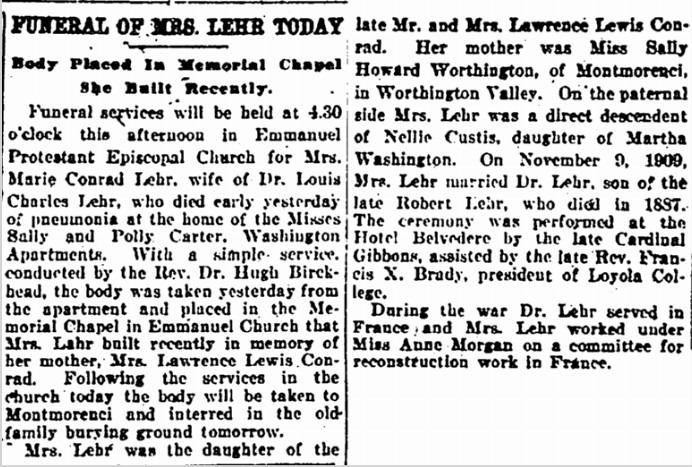 On November 9, 1909, Mrs. Lehr married Dr. Lehr, son of the late Robert Lehr, who died in 1887. The ceremony was performed at the Hotel Belvedere by the late Cardinal Gibbons, assisted by the late Rev. Francis X. Brady, president of Loyola College. During the war Dr. Lehr served in France and Mrs. Lehr worked under Miss Anne Morgan on the committee for reconstruction work in France. June 7, 1921 Mortuary Notice for Marie Conrad Lehr, Baltimore Sun, Baltimore, Maryland. Genealogy Bank. There are a number of follow up items, on my ToDo list, about her and I know there are other newspaper articles, and another visit to Baltimore will need to be scheduled. She isn’t the first one to have a note about being buried in “the old-family burying ground”. I have other notes, indicating that some have been moved from this burial ground to Saint John’s Episcopal Church Cemetery. Will have to see if she was one of those who was moved. Of interest, is the notation what she is a descendant of Nellie Curtis, daughter of Martha Washington. Lesson Learned: The study of this house, continues to show the impact of the people in this house to their neighborhood. 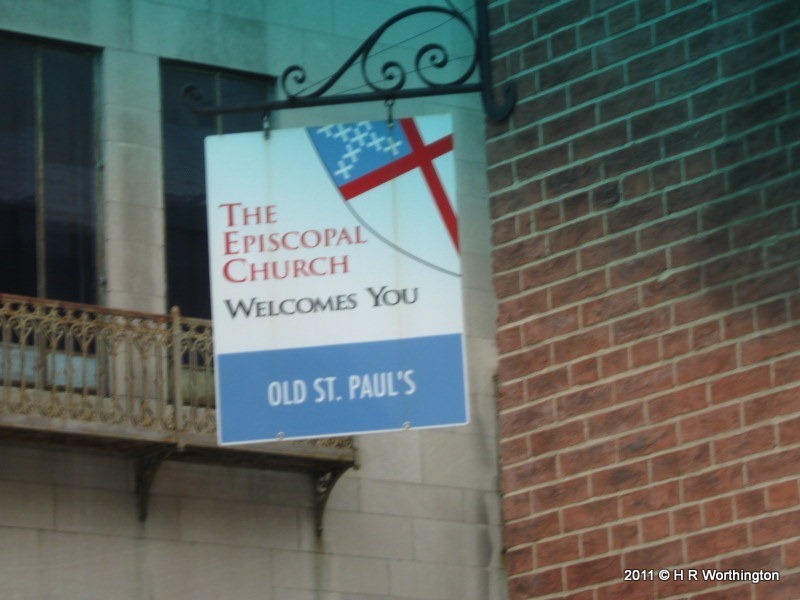 Based on this article, once again there appears to be an impact on the Episcopal Church in the area. I suspect that this will be more obvious as time goes on. In the mail today, I received a book “Marylanders in the Confederacy” by Daniel D. Hartzler, Willow Bend Books, Westminster, Maryland, 2001. In it, in one sentence confirmed by findings on Page 3. Cowpens was a battle in the Revolutionary War with General George Washington. So, John Eager Howard is the “grandfather” that was talked about in the PBS series Gettysburg. Charles Howard and son Francis (Frank) Key Howard (Key from Francis Scott Key) were captured in Baltimore by the Union Army. Sons Edward Lloyd Howard and McHenry Howard served in the 1st Maryland. James Howard had three sons that served, John Eager Howard (1797 – 1870), James McHenry Howard (1839 – 1916), and David Ridgely Howard (1844 – 1927). The best that I can tell, at this point, is the all 5 of John Eager Howards grandsons were at Gettysburg in 1863. My calculations would make David Ridgely Howard my 5th Cousin, 4 times removed. I now have a Confederate Civil War Hero. Not to mention that my Great-Grandfather, Samuel Worthington, was a Union Civil War Hero. In an earlier post on the use of a Map. I showed the relationship of where folks lived. I ran into another problem where the Street Name was not clear. I knew the house number, had seen it before in an earlier census record. In looking at the previous record, I really could read it either. It looked like East 26th Street. One think that I have learned, is to look at the neighbors. In this case, that wouldn’t really help, but the notion to go back to look at how the previous and next pages recorded the street names. 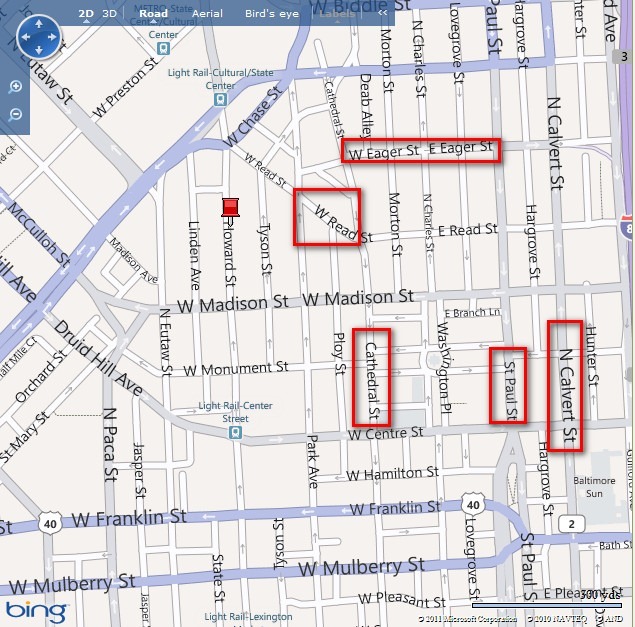 I had North Calvert Street and Guilford Streets. 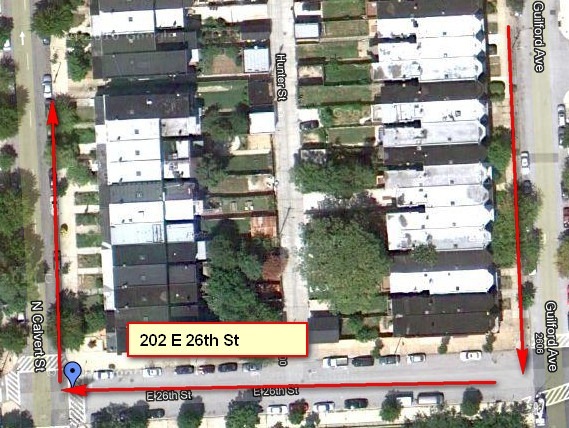 The house numbering on Guilford Street were from 2532 – 2502 (Even Numbers), then to my street, which I thought was East 26th Street, 202 – 206, then Calvert Street, 2501 – 2503 etc. So, the Census taker started at what appeared to be the 27th Street end of Guilford Street, came toward 26th street, followed 26th street and headed back to 27th street on the odd side of the street. This was from the 1910 Census. From the previous map and the fact I had been keeping track of House Numbers of Family Numbers and recording the Street Names (when available), it appeared that these street names hadn’t changed much over time. 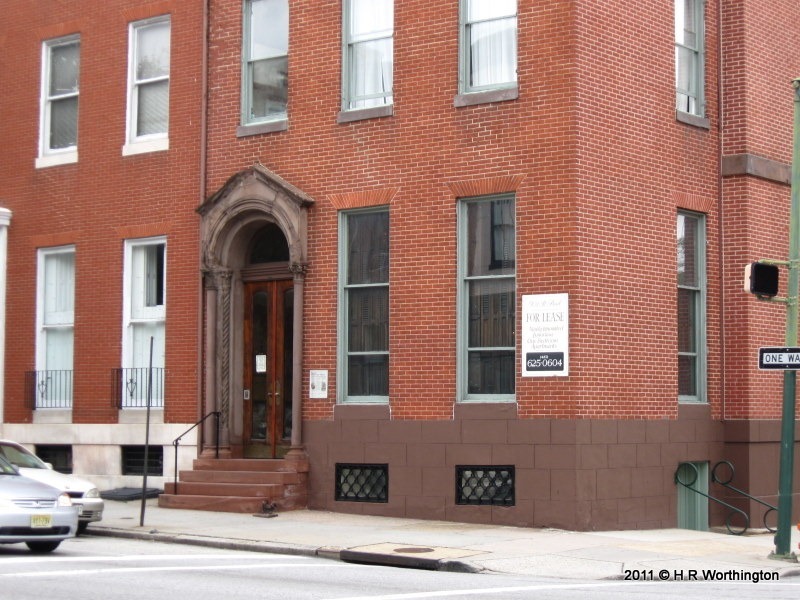 So, I did a Google Search for 202 East 26th Street, Baltimore, Maryland. Not only did I see a Google Street View (current view), but the map, sure enough, confirmed the theory. So, I now know the street name that I couldn’t read on the Census Record. Clearly this is current street information and I am sure the buildings are different, perhaps, but I was able to determine the street name by checking the Preceding and Following Census Pages and checking the house numbers. The next time I go to Baltimore, I will take all of the street names and addresses with me and take some pictures of the houses. The quick drive through recently, showed me where the houses were, but only took one picture. Will have to add the pictures to my database. One of the steps in this process is dealing with Conflicts within your genealogy database. Today was one of those days to deal with a couple of conflicts. The first was to review and adjust information on two people. James McHenry Howard and McHenry Howard. Both lived in close proximity to the other but there were two separate households. The good news is that the households stayed together, if they moved at all. Both were born about 1838 or 1839, but that might have been a census record issue. The key difference was McHenry Howard occupation was a Lawyer while James McHenry Howard was a physician. Their fathers were of similar ages, and I could connect McHenry’s father back to a long Howard Line. Couldn’t connect James McHenry Howards father back nor could I connect him to McHenry’s father. Another “conflict” was a brother of McHenry Howard’s father Charles. It has been listed as James. James was also James McHenry Howard’s father. It was not clear that these two James were the same person, but could not make any connection. I took a side step a minute to see what I may have missed. Certainly a City Directory would have shown the Doctor and the Lawyer somewhere. However, I didn’t find a good directory for the timeframe. I happened to do that search on Genealogy Bank. That’s when I found an obituary. The Obituary was for a Elizabeth Phoebe Key Howard. Key, as in Francis Scott Key. Elizabeth Phoebe Key Howard was the oldest daughter of Frances Scott Key. It listed the pallbearers, which included Messers, William R. Howard, Dr. James McHenry Howard, Edward Lloyd Key, Dr. Henry J Key, W. George Weld, Wilson Cary McHenry, Richard H. Pose, and G.T. Beaureguard Howard, all of whom are family connections of Mrs. Howard. Dr. James McHenry was not a son of Mrs. Howard, William R. Howard WAS a brother of McHenry Howard. Reviewing the Census Records and how I had recorded the relationships I had found, I resolved the two James Howards, as the same person, making James McHenry Howard’s Father, the Brother of McHenry Howard’s Father. Lesson Learned: The Obituary pointed the way “all whom are family connections of Mrs. Howard to a review of the relationships established in the Census Records. The two families were buried in separate cemeteries but they lived in the same neighborhood. The headstones firmed but the relationships. A bonus: This puts David Ridgely Howard into my Family Tree. Having reviewed a number of Census Records for this project, and the brief visit to Baltimore last week, I wanted to put things into perspective. What better way then a map. Each of the hi-lighted streets are where these households were located. Family Names are in these streets. Eager, Read. 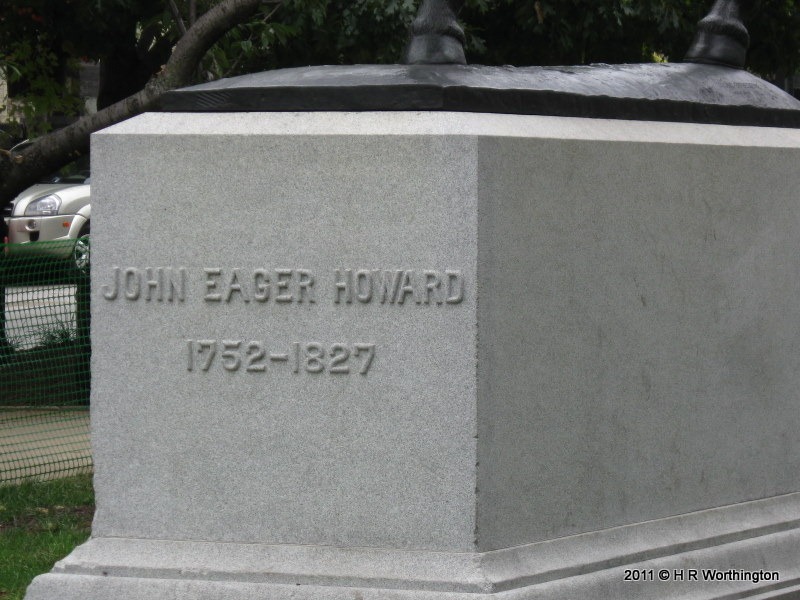 The John Eager Howard monument is on Monument Street. Certainly the people I have found in the search of this project must have had an impact on the area. I must say, that I haven’t posted all of my findings on this project. I am really trying to stay focused on the Methodology that Dr. Jones has presented. Going through all of the pictures from yesterday, I thought that I would show one of my findings. Driving around Baltimore, “in search of …. “ the Howards, I saw a new monument about a block from one of the houses that I found. This house is 901 St Paul Street. McHenry Howard and household in the 1920 Census. Up the street, within the block was another residence of this household in previous census records. There is a historical marker, which I couldn’t get close enough to, said that this was the home of Samuel Shoemaker (another mystery). But, there it is. 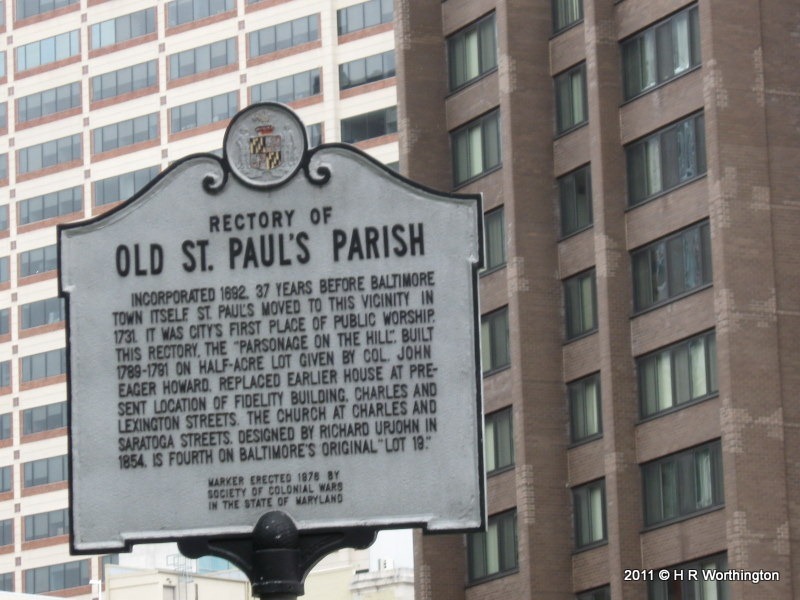 St. Paul Street carries the name of an Episcopal Church not to far away. 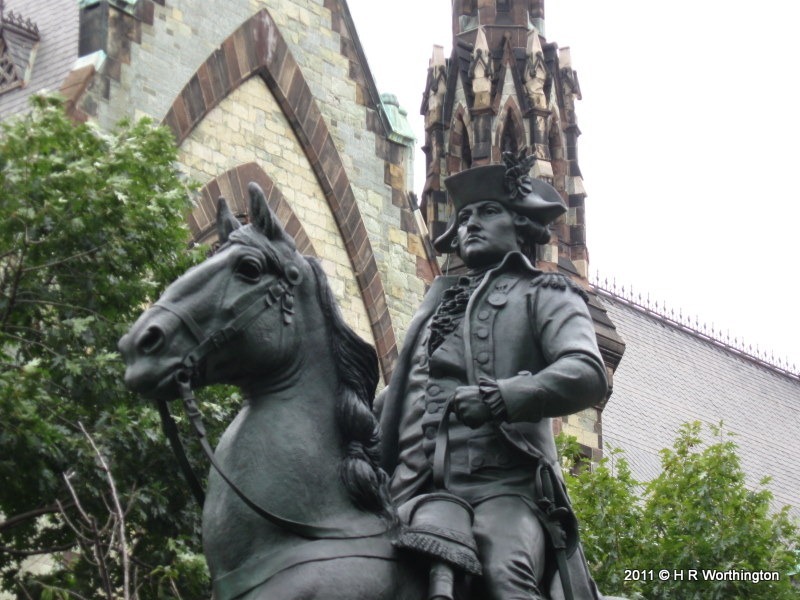 Behind me, as I took this picture a block or two was a statue of John Eager Howard (1752-1827). Within a block or two was Eager Street. Like many folks I have run across in this project, he has a story. Here is a picture of the Statue. I could not get a good enough position to take a picture of the church itself, but I will visit one day when I can get it. Mentioned in a previous Blog post, Worthington’s were at this church, moved out to St. Thomas Garrison Forrest, then to Worthington Valley. But, I digress. Back to John Eager Howard. If you read this sign: this lot was proved by Col. John Eager Howard. Why all of the interest in this little side trip, away from David Ridgely Howard? I peeked at my own database and guess who I found. John Eager Howard. His wife is my 3rd Cousin, 6 times removed. That linkage, may hold the clue to David Ridgely Howard. I have often heard, “look sideways”. This to me is one of those glances sideways. I have David Ridgeley Howards’ names, but can’t get the previous generation. It is obvious to me, that the folks that I have found, for this project, were known and had an impact on Baltimore. Many of the surnames I have mentioned thus far are street names within blocks of where these pictures were taken. Lesson Learned: Had I only known what I would be doing when I retired, I would have “walked the streets” when I worked in Baltimore. These places are all within walking distance of my job. After taking a quick glance of about 200 photos from yesterday, I am almost confused. It’s all about names, right? This project started when I watched the PBS series Gettysburg. I heard the name Ridgely Howard. In my research in my own family both of these names are surnames. As I started the research Ridgely was his middle name. No problem, been there, done that. I go by my middle name. Simple reason, I am a “III” (3rd), and there were three generations living on a small family farm. My grandfather went by his middle name, the Surname of a Grandfather, my Dad by his first name, and I was called the same way my grandfather was. This worked and still works, although my Dad has passed away. To clear the confusion about who you were talking to. Grandfather, Father, on me. So, we now have David Ridgely Howard. (there’s a twist, a common first name for a Surname). “My” Howards were in Virginia, soon there after into Maryland. So, Howard, to me, as a Surname is OK. Got that. Looking at Census Records, for the Howards, McHenry as a Middle name was appearing, and a First Name. Good thing I didn’t jump to any conclusions here. Could that Census Record have recorded McHenry, like Ridgely as the first name? The biggest problem at this point is the names of member of the Households. For example, McHenry Howard and James McHenry Howard households had similar members of the household, living in close proximity of each other. At this point, it’s pretty clear that they are not the same family (yet). The cemetery visits may have also separated the families (house holds) as well. Two different cemeteries, different parts of town. BUT, it may be a common Church. Working on that. So, I looked at my pictures from the 3rd cemetery and I run into the same issue. My brain had told me that I had taken pictures of Howard headstones and McHenry headstones. Both of which were true and I clearly remembers one of the Howard children as Julianna Howard. So I took a bunch of pictures of the plot (10 – 15 stones). Her stone was Julianna Howard McHenry, whose father was James Howard McHenry. The dates for Julianna were not right. I have been putting off looking at the history of Fort McHenry, also in Baltimore. A couple of years ago, while visiting my brother-in-law in a Veterans Hospital in Baltimore, we went to a historic cemetery that was next to where I had parked the car. In my search for the 1st cemetery, where “Betty Lou” was giving me a fit, you know “recalculating”, I saw an old cemetery, then realized it was the same one we had visited a couple of years earlier. My car has a bumper sticker “I stop at cemeteries”, so I did. Went in where Edgar Allen Poe is buried, but so is James McHenry, of Fort McHenry fame. So how does James McHenry Howard, James Howard McHenry, McHenry Howard related to David Ridgely Howard? What did I learn from this: Where did THAT Name come from? Naming patterns ….